Would you care to hear a cautionary tale? It’s about Twitter, like they all are. It’s also about Taylor Swift. And New Zealand. I’m generally a sporadic and halfhearted tweeter, wary of engaging, reluctant to put myself more in the path of the Internet than is strictly necessary. I’m only on Twitter because my publisher asked me to be, so mostly I tweet about upcoming book events, about my dog, about other people’s books. If, in life, a political issue turns me into an aspirin-chewing profanity-spewer, I may venture a tentative retweet of the New York Times. Once or twice I’ve publicly pestered customer service at big companies to pay attention to my complaints, which is depressingly effective. Airports, though, bring out the latent tweeter in me. Maybe it’s because I almost always travel alone and there’s never a convenient human around to listen to my gripes. For example: people who read over my shoulder on airplanes while I try to work and even go so far as to comment on my writing? I don’t like them. The insanely abundant and inescapable flatscreens airing CNN at full volume at every gate in the Atlanta airport? I believe ATL may be a black site for testing new forms of torture. Download the Amazon app or watch an ad in order to access free Wi-Fi? I choose death! Cut to the night of Saturday, Nov. 21. 8:45 p.m. PST. I was at LAX waiting for a flight to Auckland. I’d be gone for a month—10 days working my way southward through New Zealand to the city of Dunedin, from where, on a magazine assignment, I would catch a ship for some wind-blasted islands halfway to Antarctica. On my way home, I’d spend a few days warming up in the Cook Islands. I’d traveled alone in New Zealand before, blissfully, and was looking forward to repeating the experience. As I moseyed up and down Tom Bradley International Terminal, I was mulling over whether, perhaps, the people who say not to drink alcohol before or during flights may not have fully considered the fact that I might really want to. Three flights were leaving for Auckland within two hours—sweet, in a way, to think of our little flock of planes playing follow-the-leader over the ocean—and as I passed the gate for the one before mine, my eye snagged on a slight, unadorned young woman in a black sweater. I slowed. Did I know her? No. Or—yes. It was Taylor Swift. The gate area was almost empty. Final boarding had already been called. She was standing with a small clump of people (her team, I supposed) and appeared to be signing an autograph for someone, maybe the gate agent. Not wanting to be rude, I looked away and continued on. In L.A., where I live, celebrity sightings are common. At my neighborhood coffee shop, just in the month or so before I left for New Zealand, I’d seen Mark Duplass, Alia Shawkat, the red-haired guy from "Modern Family," and someone who kept his sunglasses on inside and I was like 40 percent sure was Jon Hamm. I texted a few friends. Saw Taylor Swift in the airport! Cool, they said. Gotta be a good omen. Perusing neck pillows, I considered over how difficult it must be for Taylor (if I may) to move through public spaces. Probably it was a pretty good strategy for her to hide out in a lounge somewhere until the very last minute, then beeline through the terminal and into first class with her entourage, unseen by the hundreds of people back in economy who could definitely not be trusted to be cool and let her sleep. Last on, first off. Special ops precision. That seemed right, right? Sure. I sat on the floor by the big window at my gate. Outside, the pilot was walking around our 777, aiming a flashlight at the landing gear. I picked up my phone. 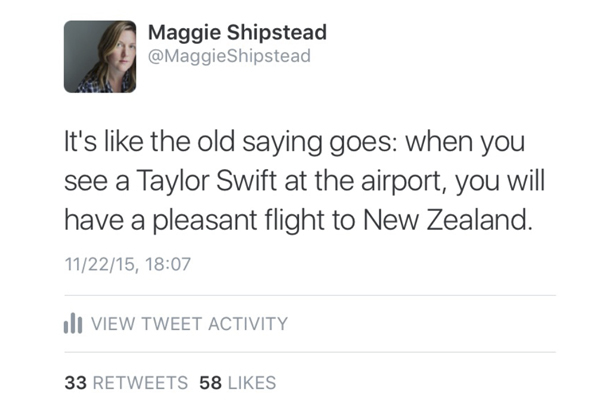 You’ll notice I didn’t actually say Taylor was going to New Zealand. I said I was. True, I was reasonably confident she’d been getting on that Auckland flight, but I hadn’t stuck around long enough to gawk her onto the jetway. Also, even though I assumed she was on her way to do a show or something else well-publicized, I didn’t want to be one of those people who publicly announce the whereabouts of celebrities, steering gaggles of paparazzi and superfans across the surface of the earth like armies in Risk. I boarded, and my excitement over Taylor was immediately dwarfed by my excitement at having an empty seat next to me. For more than 12 hours, we were in the air. As the sun rose and breakfast was served, I watched an anonymous Pacific island pass under the wing. Were there people there? I didn’t know. We landed in Auckland around 7 a.m. on Nov. 23, having crossed the international dateline and lost a day. I had a couple hours before I had to catch a connection to Wellington. I passed through customs and let a biosecurity officer examine the bottoms of my hiking shoes. I bought a coffee. I logged onto the airport Wi-Fi. I checked my email. I checked Instagram. I checked Twitter. Something . . . was happening. This was alarming. 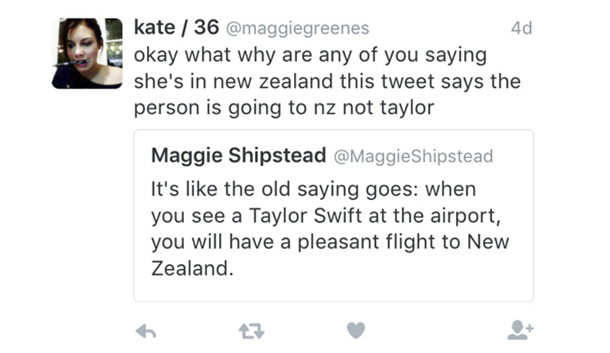 I hadn’t hashtagged Taylor, but I also hadn’t taken into account the people who continuously scour Twitter for her name and certainly not the small subset of that group who are hoping against hope she will someday be mentioned in the same sentence as New Zealand. When I failed to respond (being on an airplane and all) they began to confer among themselves, crowdsourcing the Taylorverse to see if anyone knew anything about where she was. As I absorbed the frantic intensity of their intelligence-gathering, I began to wonder: Was I legit? Had I seen Taylor Swift? How sure was I? Not so sure that anyone should fly to Auckland to hunt for her, I knew that much. What if I’d just seen some non-Taylor Swift person? I thought I’d glimpsed her signing an autograph, but what if I’d been mistaken? Would she have flown commercial? What did I really know about the range of private jets? I tried a few experimental searches. “Taylor Swift Auckland concert November 2015.” No. “Taylor Swift New Zealand.” Nothing recent. In fact, Taylor seemed to be expected to appear at the American Music Awards back in L.A. that very night, and a few fans were upset I was suggesting she might be skipping out. If she did show up at the AMAs, my goose was cooked, unless her pre-awards show routine involved flying to New Zealand and then immediately back again. I was starting to feel like someone who has confidently picked a suspect out of a police lineup, only to be confronted with exonerating evidence later. Maybe I’d had a strong subconscious desire, until now undetected, to glimpse Taylor Swift in real life, and my brain had cooked up a fun hallucination. And if I had seen Taylor, as I still thought I had, and she was trying to travel under the radar, I felt guilty for having carelessly exposed her. I would have guessed that lots of people would have seen her, that nothing she did could remain a secret, but apparently all it took was one bozo with a Twitter account to ruin everything. That’s right. 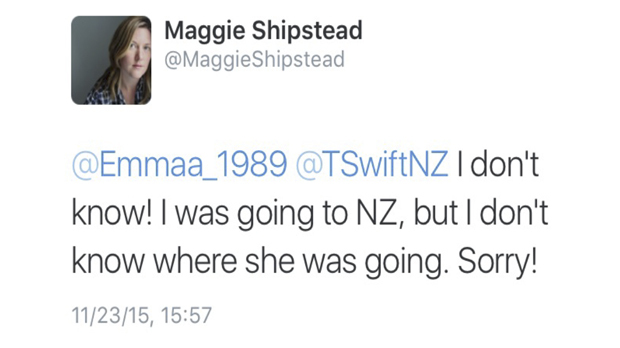 The person hadn’t said Taylor was coming to Auckland. Maybe it wasn’t too late for the person to weasel out of this. Problem: solved. Situation: neutralized. Taylor: somewhere in the universe. I didn’t actually care where. Godspeed, Taylor. In Wellington, my friend Dave picked me up at the airport. We got coffee. We ran an errand. We had lunch. Dave lives with his wife, Kelli, and their two sons in a beach town 40 minutes outside the city, and by the time we arrived and I got back on Wi-Fi, the situation had escalated. 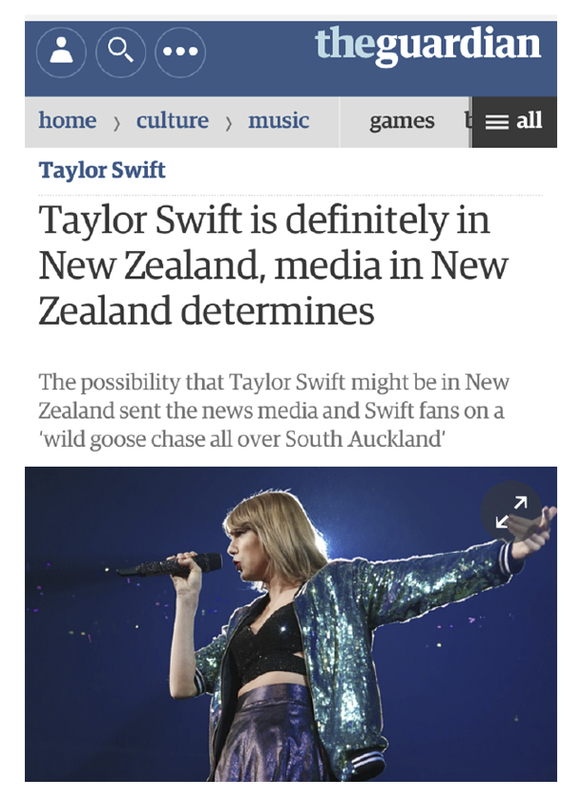 The frenzy I’d triggered among Taylor’s fans had spread to New Zealand’s online media. “Where in the world is TayTay?” read one headline. 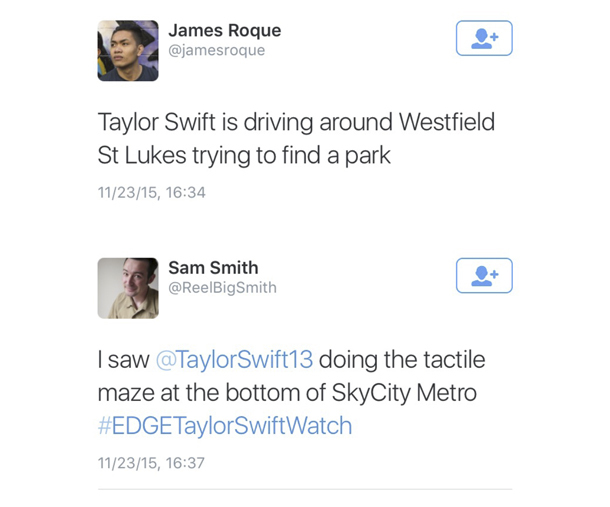 “Where in the world is Taylor Swift right now?” beseeched another. 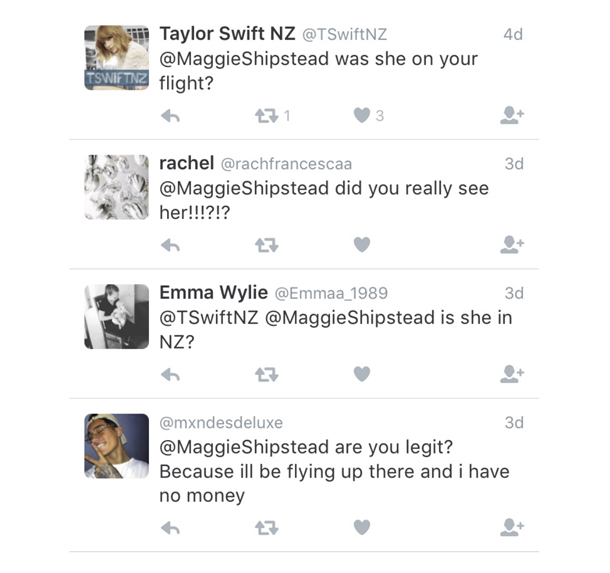 A kiwi comedian had tweeted that she’d seen Taylor at the Auckland airport that morning, then later said she’d just made up the sighting to see if she could get on the New Zealand Herald’s website. Well, she did. Along with me. Kelli sat at her laptop and laughed, listing the New Zealand news and gossip sites I was showing up on. 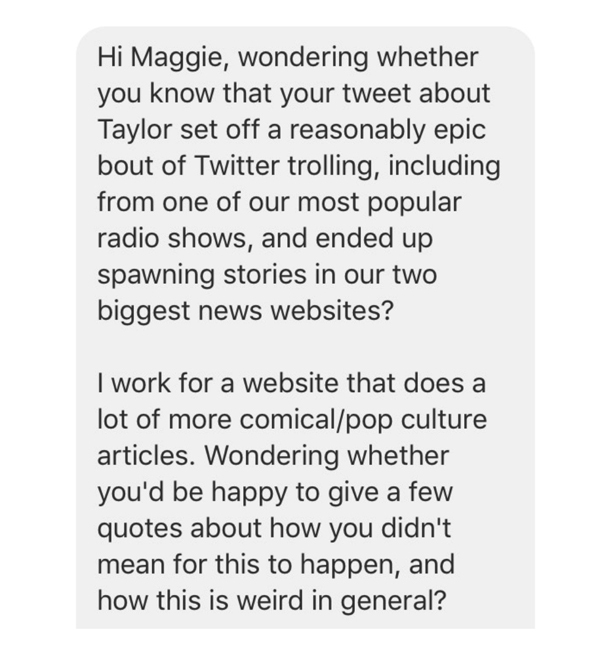 One brief and disorienting Google search later, I’d seen myself described variously as a U.S. author, a Los Angeles-based comedian (clearly I was some kind of joker), and an “eager fan” of Taylor’s. Screenshots of my tweet were everywhere. Several radio hosts reported that a customs official had seen Taylor at the airport and that multiple sources said she was filming a music video in the city, but everyone assumed they were full of it. It certainly was weird and, no, I had not meant for this to happen. I wrote back and told my little narrative and also said I wasn’t really looking to prolong things by contributing quotes. He responded that he understood my wariness. 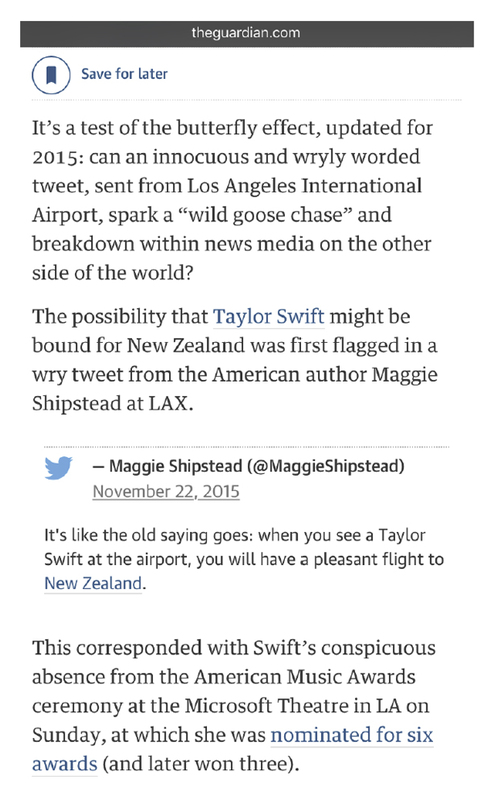 However, he’d been accumulating more and more tips that Taylor was indeed in New Zealand, and while he’d expected to be writing about how I was at the center of a massive fake story, it looked like instead I was at the center of a real, if slightly silly one. “This is a good intro to the New Zealand psyche,” he wrote. “We can’t believe she’s visiting us.” If her presence was confirmed, could he quote me? So then Taylor didn’t show up at the AMAs. A kiwi soap opera actor, Ido Drent, said he’d been in first class on her flight (NZ3, the one I’d seen! Fist pump! Yes!) and had chatted with her outside the lavatory. I started to see tweets saying that Universal Music had confirmed Taylor was filming a music video in New Zealand, although at first I wasn’t sure if they were legit. All of this had personal significance for me in a way that, 24 hours previously, I could not have imagined. I wasn’t a troll! I was a loudmouth prophet! As such, I was immediately quoted by my new friend Donnell. And so, after that, once the mystery was semi-solved, the story began to die out. I listened to pop radio while driving around the South Island and didn’t hear myself mentioned, which was honestly kind of disappointing. Taylor moved on to Australia, then presumably onward from there and onward again, as pop stars do. Where is the caution in this cautionary tale? I’m not sure. Definitely don’t disclose the locations or travel plans of celebrities online. Although I didn’t actually do that, I came too close. Maybe don’t mention celebrities at all unless you genuinely want to be involved in a larger conversation? Maybe. I don’t know. Everyone wants something different from the Internet. Just as I have a puny Twitter account, I have a puny Facebook author page, and for some reason, probably some algorithm, most of my recent likes are from men in the Middle East, Central Asia and Africa. Sometimes I look through them. One of my likers has only posted photos of groups of bearded, turbaned men in the mountains of Afghanistan. I couldn’t figure out which one he was. “Hello Ms Shipstead,” read the entirety of a message not long ago. The sender lived in Zambia. His profile picture showed a skinny, shirtless man standing in a corrugated hut. I contemplated his image for a long time. How had he found his way to my page? What were his hopes for our correspondence? What does he want? I kind of know but kind of don’t. 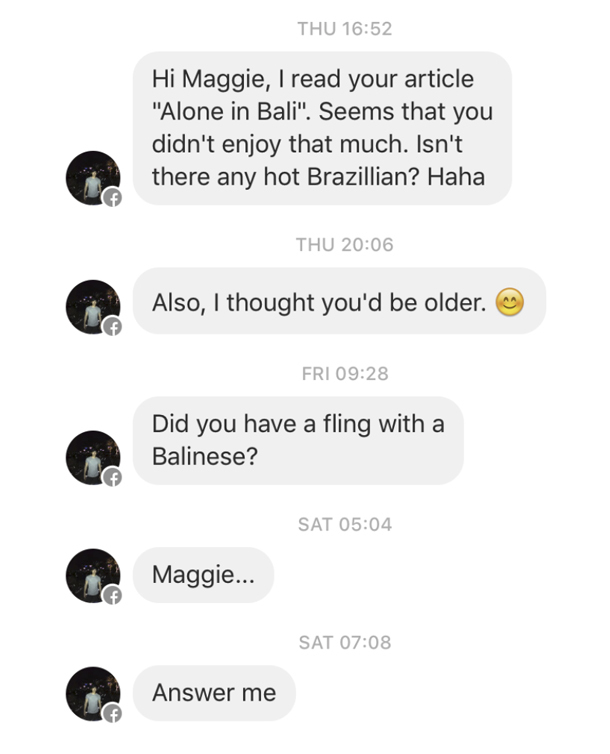 Clearly his idea of me (easily flattered, playful, eager to flirt) is nothing like the reality (prickly, solitary). Maybe we’re all at cross-purposes with one another most of the time anyway, and the Internet has only made our irreconcilable agendas and our impossible demands more visible. How many people on the Internet ask Taylor Swift for something in a day? In a year? Right now, how many people are projecting their hopes and aspirations and longings and frustrations and rages onto that young woman in the black sweater? Or onto a flickering, shifting idea of her? Answer me. What does the world want from Taylor Swift? And, by the way, where exactly is she? Does anyone know? Maggie Shipstead is the author of two novels: "Astonish Me" and "Seating Arrangements"